There's a window. On the ledge is a small radio, a small table fan, an even smaller fan, two pots of cactus and a lot of sawdust. Next to it is a longish wooden platform. There's more sawdust on the platform. Sugar soap. A mallet. A hammer. A drier. Sandpaper. More sawdust. An Ernest Hemingway is in the next window. Hardly a machine in this room. This is Chris King's workstation. In the warehouse behind this room, there are tree trunks. There are clefts of wood stacked up. They have been cut from trunks that are no more. There are industrial fans set on the clefts. There is also a kiln to dry the cleft further. These clefts are being graded based on the grains on the faces of the clefts, whether there are any marks, knots or other blemishes. 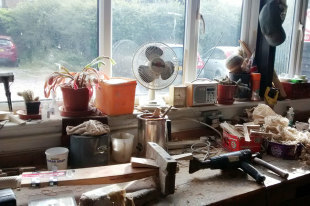 Between these two spaces in east Sussex, in this small Gray Nicolls factory, a short walk from Robertsbridge train station in east Sussex, magic is created. Cricket bats. The different sounds they make. Snick. Thwack. Tuk. A batsman's only tool of aggression. Everything else is for his defence. It's difficult to imagine they were trees once upon a time. This process starts with Gray Nicolls's growing their own willow. The willow is sent to their factories in Australia and India too. The labour is cheaper in India, and the demand high, and it makes good business sense to branch out, but the batmakers in India can hardly provide the personalised customisation the ones in England do. Ask Shivnarine Chanderpaul. He visits the factory often. He wants about nine grains, a red edge, and he wants his blade slightly longer and handle slightly shorter than other bats. Grains are the lines that run along the length of the blade. The more the grains the older the wood, and the less dense it is, which means less weight but more size. After a point, though, too many grains indicate hollowness, which means no life. King is a former freelance photographer. He studied working on wood. He has also worked in antique restoration. The Hemingway is his. Three years ago he saw a wanted advertisement for a bat technician. He joined. Freelance photography is a hard-sell. He had been working on repairs until one fine day Chanderpaul came and asked him to make his bat. Chanderpaul went on to score 87 not out and 91 with it at Lord's. King now makes all of Chanderpaul's bats. He gets a little cap at the top of the handle so he doesn't damage the bat when he is digging the bail in to mark his guard. Batsmen often leave with him a bat they like as a specimen for future bats. He looks at them, and replicates the curve, the bow, the length, the weight distribution. Some bats are lighter at the shoulder, some at the toe. He has Chris Woakes' bat here. Often Niall O'Brien comes and spends a full day, just taking in the process. He goes and gets food for everyone here during the lunch hour. Then there are others who are not fussy at all. Alastair Cook can pick up a bat from a retail store and score runs. He is not as particular as the others. Once Cook broke a new bat two overs into an innings. King felt gutted. He feels anxious every time he has given someone a new bat. Among batmakers, it is a bit of a fantasy team. King has Cook, Woakes and Chanderpaul among others. King feels a batmaker has to be as much a psychologist as a craftsman. This is a bit of a revelation. The size of the bat, he says, is all about psychology. Gray Nicolls have done tests at Imperial College in London, which prove that the width of the blade makes no different to how far the ball travels; the weight does. King is a big believer that when the batsman glances down at the bat tapping down behind his back foot, he feels empowered by looking at the massive tool. It is a bit like hitting sixes on small fields that would have been sixes at the MCG too, just because your mind has been freed up by the small boundary. At the MCG you fear you will hole out. The bat doesn't swing that smoothly then. In their heads, King feels, batsmen feel bigger bats will send the ball far; they do, but it's because their belief in the bats frees up their minds and results in a cleaner swing. There are many other older bats in this building. There is the legendary Scoop. The Lara 501 Scoop. That bat during the days of the Chappells was one of the first big innovative steps for bats. The Scoop was one of the first to take out weight from behind the blade, through two ridges, giving it a thicker appearance with the same weight. The Scoop is one of the most recognisable bats. Apart from Lara scoring his runs, Greg Chappell used it to smack a streaker, one of the more famous cricket incidents. It just so happened that Andrew Symonds also had a Gray Nicolls in hand when he tackled a streaker. Until the Scoop bats hadn't evolved much. Since that innovation push in the late-'70s/early-'80s, they've come a long way. You can see how thick Andrew Strauss's blade grew during his playing days. One of his first and one of his last bats are both here. His was almost the old-fashioned thin bat when he first began to play. He ended with a monster that looks like Woakes's, which is our reference point during the factory tour. Linseed oil need not even be talked about. They also have a stoolball bat, which is no bigger than a frying pan, and a looks like a bigger version of a table-tennis racket. Stoolball, traditionally a sport played by milkmaids, is believed my many to be an ancestor of cricket, baseball and rounders. As the game stands today, the ball is delivered underarm from 10 yards, and the stoolball bat is used to hit it away. In its original form, the only way to score runs was to defend the stool, which was the wicket, for a run each. In its modern form, stoolball includes fours and sixes and running between the wickets, as in cricket. The diameter of the playing field is about 90 yards. The real beauty here, though, is Wally Hammond's bat. It's a beautiful walnut brown, but that's mostly because of age. It weighs only 2lb, and looks tiny. Almost like the technique bats used by coaches nowadays. 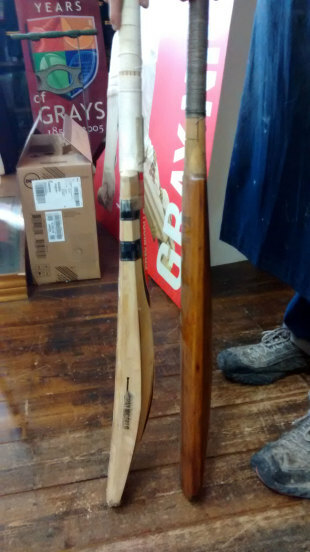 A technique bat, which companies have now begun to manufacture, is less than half as wide as a normal bat. It is used only in the nets by perfectionists. Geoffrey Boycott's mum's stick of rhubarb wouldn't be much narrower. The thing about Hammond's bat, though, is it is the kind that hit the only six over the Lord's pavilion. Albert Trott did it in 1889. That is a massive six. Marcus Trescothick was offered a million pounds in 2010 if he could hit one over, but even his thick and wide bat couldn't manage it. King goes back to psychology. He will concede, though, that modern pressing and drying, which gives you more volume for less weight, has increased the size of the middle. It might not send the ball farther, but a larger middle frees the mind up. The bowler also sort of fears those massive willows. One of these days hopefully a batsman will come along and use an older thin bat, even a Scoop, which is much thinner than the modern bats, and hit the ball just as far and score just as many runs. King, and other batmakers who are having to think of newer, snazzier shapes every day, will possibly smile a little smile.